Manuel Neuer is a German footballer and current goalkeeper who play for Bayern Munich. Neuer attended Gesamtschule Berger Feld. His brother Marcel is currently a football referee in the Verbandsliga. Young and beautiful, Neuer is the dream for many girls. However, he is in a relationship. 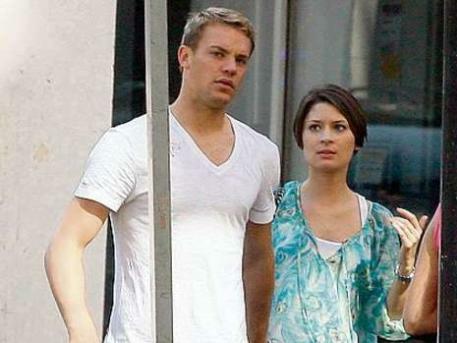 There are photos of Manuel Neuer and his girlfriend and rumors are that they have been together since 2009. Her name is Kathrin Glich and she is a model. The couple does not want to be seen in public and do not advertise their relationship. During the 2010 FIFA World Cup in South Africa, the tabloids reporters have been very active behind the scenes of the Germany World Cup team. The paparazzi wanted to take tidbit photos of the footballers’ WAGs (Wives and Girlfriends). Manuel Neuer does not like it at all when his girlfriend shows up in the public eye. However, she is hunting for glory and advertising anyway. She promoted Ferrero's ‘Fan Connection’ in 'BILD am SONNTAG' as the "girlfriend of Manuel Neuer”. Hi I dont know why everyone wants to have or make a football player girlfriend a "model" she is really a hair stylist, she is from a family or hair stylist If I remember correctly up to 5 generations have been that, hair stylist. She have done that modeling job like a lot of footballers girlfriends have done it.. dunno why exactly. @Ishita, I don't know as well, thanks for the comment..